The living room area of the great room opens onto the pool and large lawn. Flat screen TV with Netflix. Open, sunny great room. Open the large french doors and let in the breeze. Living room with a sofa bed opens onto the pool. Sofa opens out to be a sofa bed. Lovely well equiped kitchen with granite counters, full size gas stove and center island. 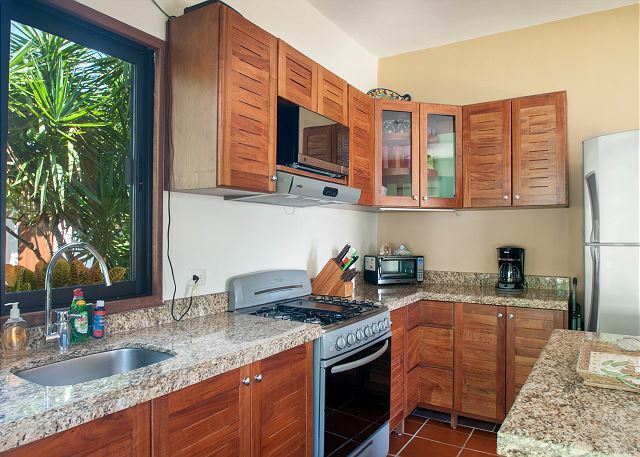 Large kitchen with granite counter tops and new wood cabinets. Master bedroom opens onto the pool and has a private bathroom with walk in shower. New king bed in 2016. Master bedroom with king bed. Large closet. Master bedroom with king bed and private bathroom with walk-in shower. Private bath with walk-in shower off the master bedroom. It has a door that opens onto the pool area. Second bedroom can be made up as a king or 2 single beds. 2nd bedroom made up as 2 singles. Can also be made up as a king. Large closet in the second bedroom. Doorway to great room. Bathroom to the left. Bathroom off the living room with walk-in show. 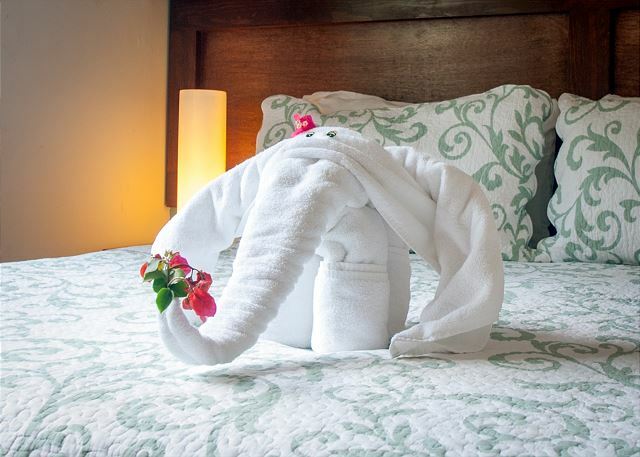 Charming towel animals created by the housekeeping staff. Granite counter tops. The house has A/C throughout and a second bathroom in the main bedroom. The second bath has a door out to the pool area for easy access. 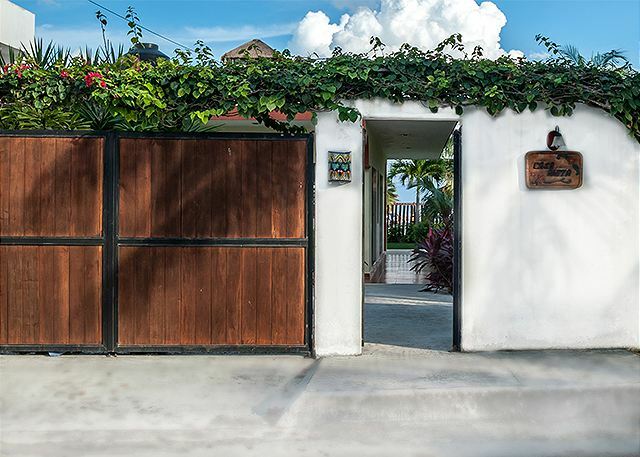 This charming 2-bedroom home is on a huge lot with big lawn, gorgeous pool and partial view of the ocean. Big french doors let in the breeze. 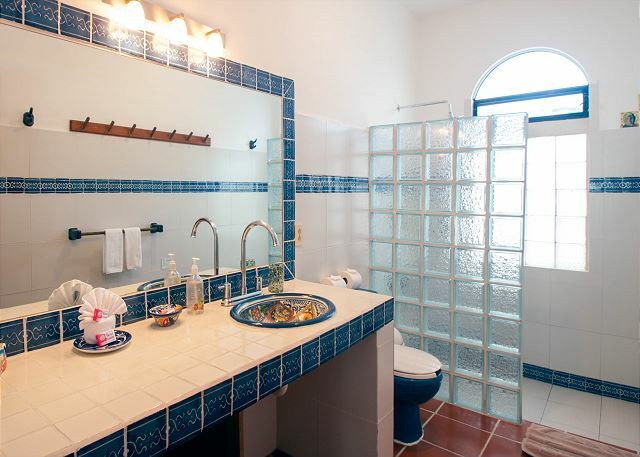 Fully equipped kitchen, free Wi-Fi, flat screen TV and charming Mexican decor. The second bedroom can be made up as a king bed or two singles. The other bedroom is a brand-new king bed. The beach is straight out your back door and down the access alley. 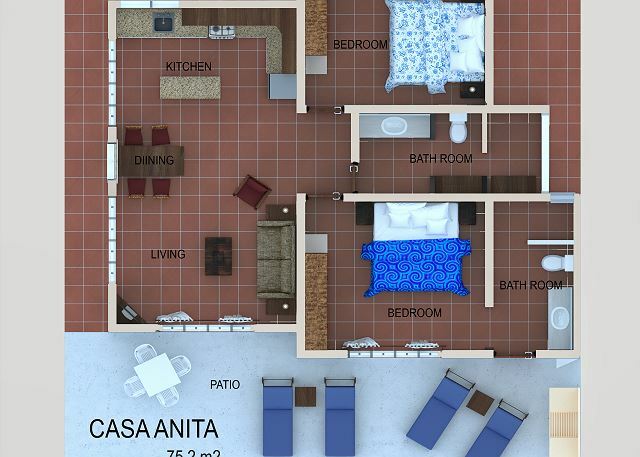 We have a central office at Abbey del Sol just across the street from Casa Anita. Our English-speaking manager can help you have the perfect vacation. We can help arrange individualized tours and excursions. Perfect for large groups that can be housed in our various properties. Rooms Sleeps 6, Base rate for 4 guests. $40/person/night for extra. Sleeper sofa sleeps 1 adult or 2 children but not 2 adults. Single beds can be made into a king. We have stayed on this property for 6 or 7 years now and it keeps getting better. Very attentive staff, sometimes a tad too attentive when it comes to cleaning the yard. Highly recommend Abbey Del Sol. Thank you for your feedback Chris, we appreciate you coming back. Abbey del Sol was great to deal with and made us feel at home. They were very attentive to our needs and answered all our questions about how to take advantage of what Puerto Morelos had to offer. We Look forward to meeting the rest of your familia, thank you for your feedback. Thoroughly delighted with our stay at Villa Anita. It was all we had hoped for. 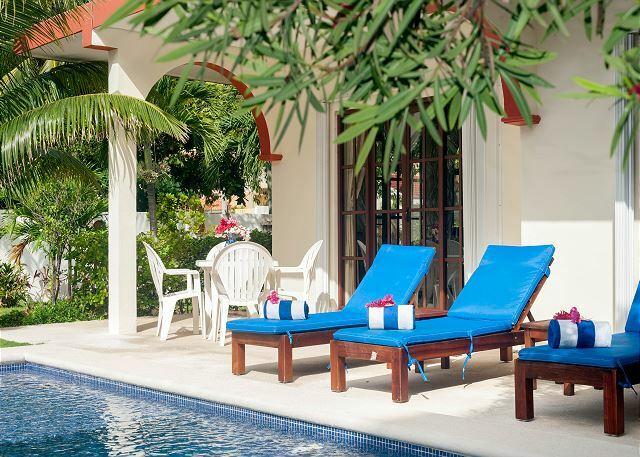 The villa is well equipped and very comfortable. The private pool is lovely, well maintained and refreshing. The location is perfect and only a two minute walk from the beach. We found all the staff, from the moment we were picked up at the airport in Cancun to the moment we were dropped off, to be pleasant, considerate and helpful. We will hopefully return. Thank you for your feedback, we appreciate knowing you enjoyed your stay at Casa Anita ! We look forward to your next visit. 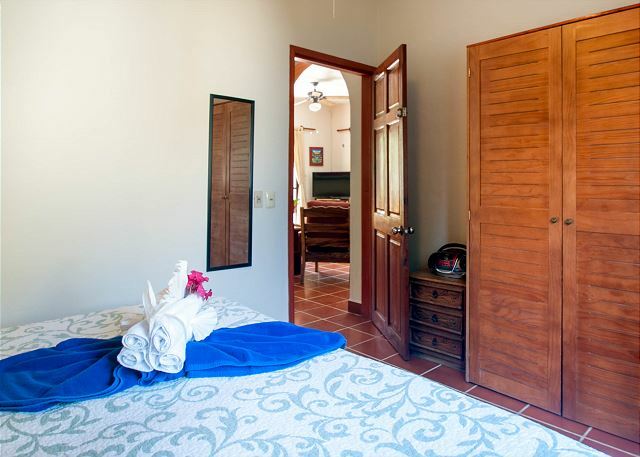 We had a wonderful experience renting Casa Anita through Abbey del Sol!The two bedroom/two bath unit was just as described and was perfect for our two couples traveling together. The unit, pool, and grounds were spotless being maintained several times a week. We really enjoyed the pool and walking to the beach a block away. It was a real treat to be warm and enjoy having breakfast outside daily. Jin and the staff were terrific! They arranged several tours for our group and made the transportation easy. We would highly recommend Abbey del Sol to everyone! Thank you for your feedback! We are happy to hear you had a great time, what an adventurous group you guys are. Looking forward to you next visit. Very nice home justand very close to the beach. The staff was great too. Thank you Amy and Mike for staying with us, WE are happy to know you and your parents enjoyed the house. We look forward to your next visit! Hola Tom and Bonnie, we love having you stay with us! See you next year. The kids enjoyed very much, we will be back soon. It was a pleasure having you and your girls stay with us! We hope to see you back here very soon. Casa Anita is such a beautiful vacation home. We enjoyed our days lounging out by the pool and making food and drinks in the well supplied kitchen (it had everything we needed and more). The house is very clean and bright. The staff at Abbey Del Sol are so kind and helpful. The location was convenient and super safe (only a few minutes from the square by car and a few steps from the beach) and everything from the listing was accurate. I actually think the place is more beautiful than the photos show! The pool and property were very well maintained. I would 100% recommend this property. Some of our favourite restaurants that we ate at: Las Koras, El Manglar, Pelicanos, Le Papillon, Punta Corcho (try the Coco Relleno) the bar at Posada Amor was so cute and the drinks were phenomenal. We thank you at Abbey Del Sol for your feedback and kind comments. We are pleased to hear you enjoyed your birthday out here with us and enjoyed our town. P.S. We enjoyed the cake very much! thank you for sharing it. 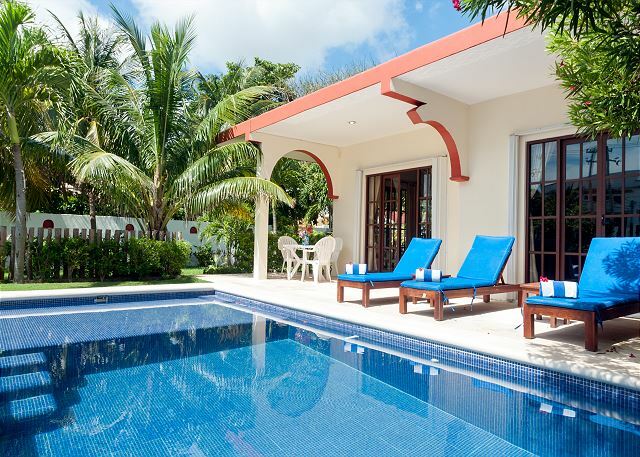 Lovely villa with pool, very comfortable stay and a short walk from the beach. We enjoyed our stay at this property. Tropical Storm Bud put a damper on our stay, but there's nothing management could have done about the weather. There were a few maintenance issues with the proptery (shower drain, water leaking through doors, etc) but they were addressed promptly. Also we wish there were more seating in the living area. 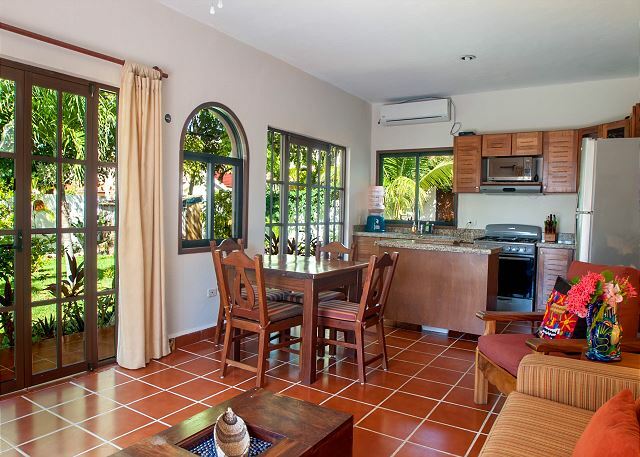 Casa Anita is a lovely 2 bedroomed property which is well positioned in the town of Puerto Morales. The house is clean and tidy and well appointed. The beds are comfy and although the shower doesn't have a lot of power the temperature is fine. The bikes provided were very useful for getting to and from town/shops. Simply furnished and lovely small house. Very comfortable bed. Well equipped, modern kitchen. Great small pool. Beautiful garden. Nice neighborhood. 2 short blocks from beach. Can't wait to go back. This space was everything we hoped it would be and we'd return in a heartbeat. Casa Anita was the perfect getaway. A cute home with all the ameneties anyone would need. Nice pool, comforfable furnishings, and nice staff. This property was everything we’d hoped for – and a little bit more. Everything we needed was there, the pool is lovely, the beach is amazingly close and almost empty during our April stay. The town itself is charming. And it’s hard to take in that it is so close to the mayhem of Cancun and so convenient to the airport. Here’s to the next time, which we are already dreaming about. Enjoyed Casa Anita, getting harder to reserve because of the popularity. It's where we want to be. Perfect private spot with fenced pool and yard, but just a short walk to the beach if that's your preference. The house is beautiful and has all the things you need for a comfortable vacation. The attentive and friendly staff is close by and available in the event you do need anything. Communication was excellent and if you want to experience some local adventures, they can arrange many types of outings. We took a trip to Ek Balaam, swam in a cenote, saw wood carvers in the jungle, had lunch with a family in a small village and went to the Sunday market in Cancun - all expertly guided and very enjoyable. A short walk to the town square brings you to too many restaurants to try in one trip. We had excellent food and service everywhere! Book it - you will be glad you chose this place! 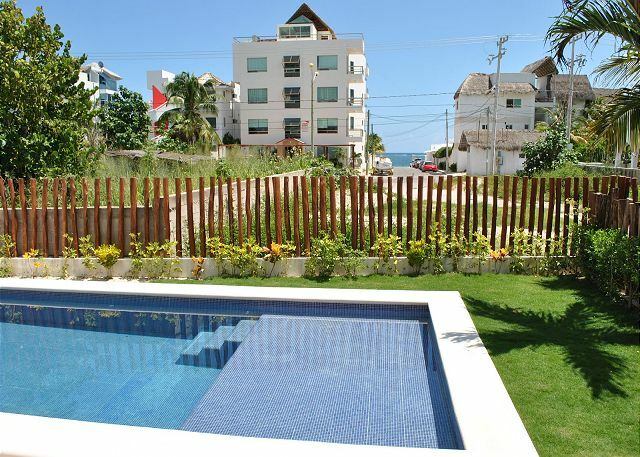 la casa es hermosa y acojedora con todos los espacion bien distribuidos, la atencion por parte del personal excelente son muy amables y estan al pendiente de que uno tenga lo necesario la ubicacion de la casa es cerca de la playa y es muy tranquilo el lugar, me encanto....!!!! Casa Anita is a great place for no more than 4 people. Extremely clean, nice beds. Great air conditioning. 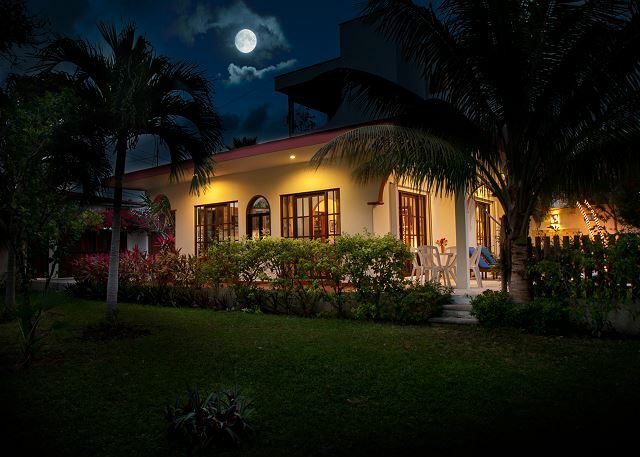 We really enjoyed Casa Anita and Puerto Morelos. It's a fairly quiet town (at least in August) with lots of good food, and the house itself was great, especially the pool. The pictures actually do it justice! we usually do the all inclusive vacations. This time we were traveling with another couple and we split the cost of the house. We arranged the shuttle service and they were ready and waiting for us as scheduled. The home surpassed our expectations, it was beautiful and clean equipped with all the necessities. The pool was great to have, and beach access easy! Hopefully the lot behind does not get developed any time soon! Office staff were extremely helpful and arranged taxi service, car rental, bike rental and even called a restaurant for our reservation! Marissa spoke English very well, and was very approachable. The home is located at the outskirts of the town centre but is an easy bike ride to shops. Unico beach front Restaurant is just across the street, great food and massage service there. 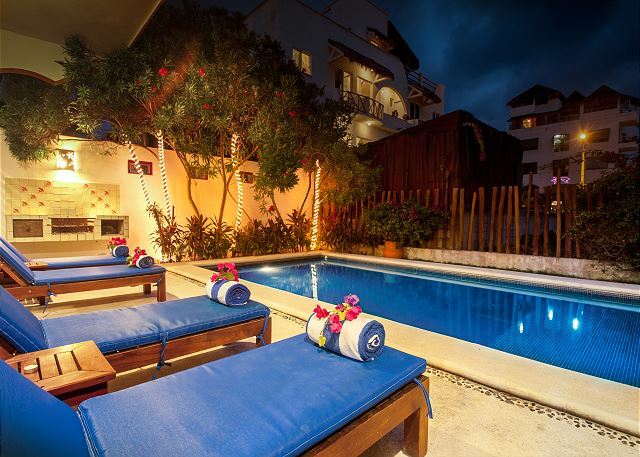 I would highly recommend Casa Anita for your next holiday! My wife and I stayed at Casa Anita during a recent (5/3/17-5/9/17) trip to Puerto Morelos. We could not have been happier with our choice of accommodations. The home is beautiful and well maintained. The only complaint we had was having to leave and go back home to the US. 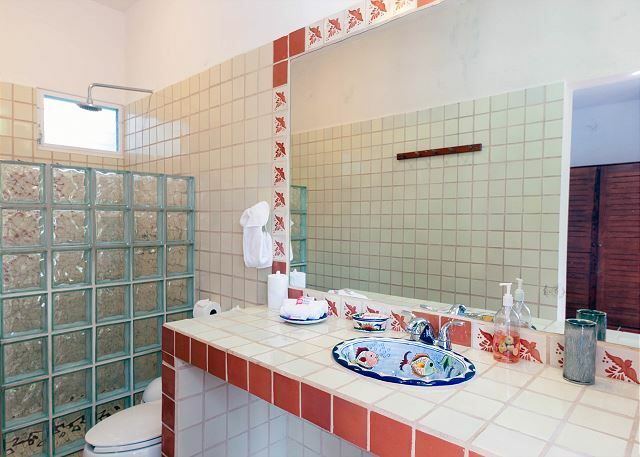 I would like to make sure that anyone considering Casa Anita for the first time and are concerned about its proximity to the beach, the beach is very close. The previous week we stayed at a resort in Playa del Carmen and the walk from our room to the beach was much longer than it was from Casa Anita to the beach. You are literally about a 1 minute walk away from stepping into the warm waters of the Caribbean! We took daily advantage of the on-site bicycles and rode into town to eat and shop. Puerto Morelos is beautiful! You won't be disappointed. Nice two bedroom/two bath home on north side of town (about 8 blocks from town square). Home was clean and well maintained. 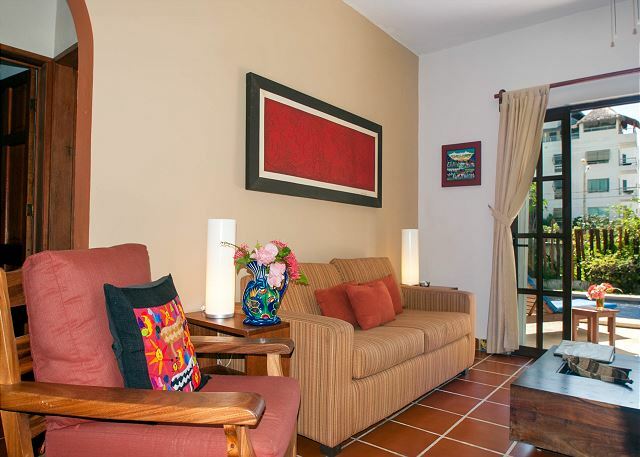 I have stayed at Casa Anita several times and keep coming back due to the setting, amenities and comforts this property offers. Very peaceful with beautiful garden with lots of birds and other nature. Bring your clothes and enjoy. Abbey del Sol staff are the best and will help you with whatever needs you might have! A great place managed by terrific team. We will be back, hopefully soon! 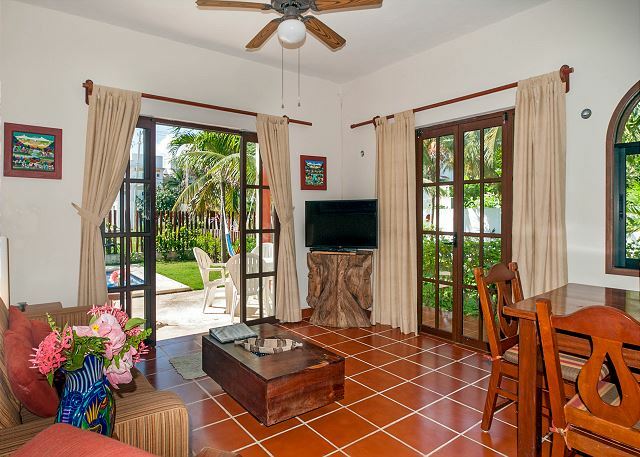 Casa Anita is a cute and comfortable house with beautiful grounds, in a quiet neighborhood close to the beach. Everyone at Abbey del Sol is so helpful and friendly. It feels like home away from home. The house was wonderful....but the Abbey Del Sol people are so great and can never do enough for you. From the moment we were picked up at the airport to the day we left we had nothing but exceptional experience. This is our second stay at Casa Anita and again it was simply wonderful! The house, pool and garden are all beautiful. Staff are helpful, friendly and knowledgeable. This time I went with my father and my two girls aged 12 and 8, there was fun things to do for all of us, we will be back again! Casa Anita was perfect !! We really enjoyed Casa Anita and the support from the whole Abbey Del Sol team. 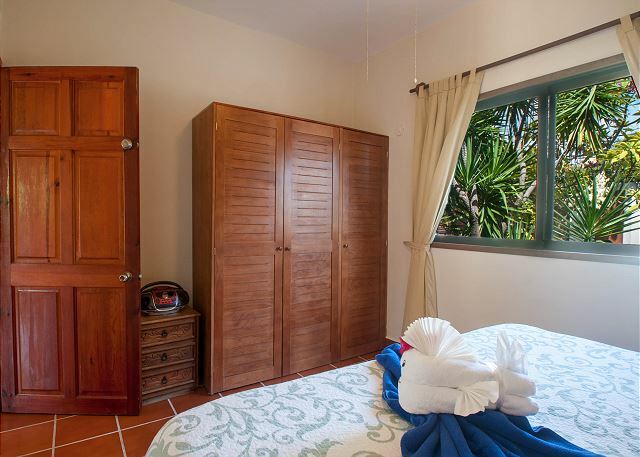 Casa Anita is spotlessly clean very well equipped and in a great location just a short walk to the beach (only problem with that is you are leaving the lovely garden and pool !!) or an easy stroll into town which has a really good selection of restaurants. The only problem we had, was with a Taxi booking I had made from England that did not turn up , however Nancy in the Abbey Del Sol office resolved the problem really quickly. Jin picked us up from the Airport and took us back again in a nice car and right on time both ways. 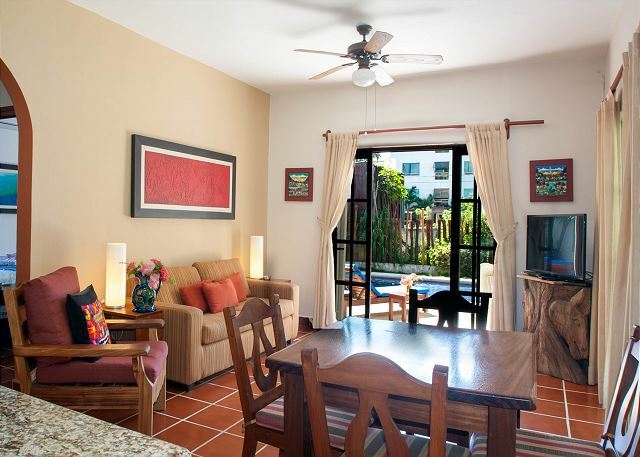 We would definitely stay at Casa Anita again or if unavailable another Abbey Del Sol property. I stayed at Casa Anita with 2 others girlfriends for 3 nights in early May. It was perfect. Everything was as expected or better than could be imagined. Loved the location, access to beach, and the pool. We really enjoyed riding bikes around town, always felt safe, loved the lawn & landscaping. Will definitely be back ! Casa Anita was perfect ! I spent 10 amazing days in Casa Anita in April with my husband. We loved everything about this house, just 50 yards from the beach and a short walk to town (or a fun bike ride away).The neighborhood is so peaceful and beautiful,we always felt safe. The pool is fantastic! it was hard to leave such a paradise even to go to the beach. The house was spotless and well equipped. Everybody at Abby del Sol were always helpful, specially Jin and Nancy. We will definitely be back! I love staying at Abbey del Sol Vacation properties. They are a great group of people and if you need help with something, it happens very quickly. Great place! The location is great - not too close to the square but a nice walk in the evening to go out for dinner. Everything was great. 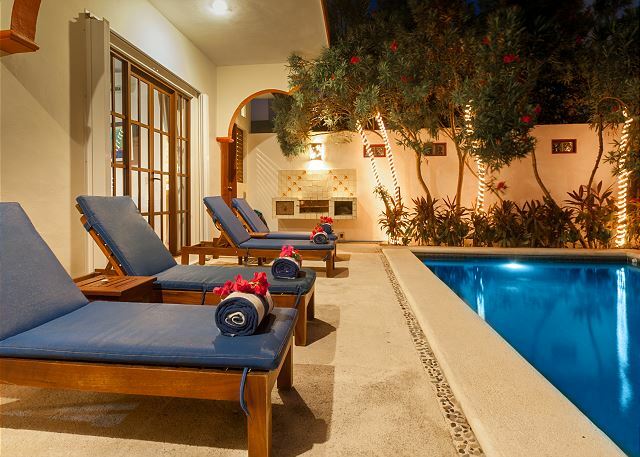 Fantastic pool, amenities, bikes, views of the ocean, and amazing restaurants within minutes. Has a great time at the rental and will definitely be back. We spent a week at Casa Anita in our favorite Yucatan town of Puerto Morales. CA was exactly as described on the Abbey del Sol website. The property is secluded (though in town), beautiful, and tasteful. We will certainly return next year. Came to PM to experience a more unique/native Mexico and we were not disappointed. The village is charming. We felt very safe, walked everywhere we went and the property itself was perfect. The location was excellent. We are a family of runners and the streets in front of, as well as behind were awesome for our morning run! This was a very cute home in a perfect location. A short walk to the beach you can see it from the backyard. My kids enjoyed the pool and feeding the iguanas. The town is close enough and has many good restaurants. We stayed in Casa Anita for 7 nights in December. It's a block off the beach & only a 10 minute walk to the town square. We loved this little house. There were 2 adults & 2 children under 4. We will stay here again. It was clean, well equipped, & perfectly located. We enjoyed walking into the square each evening for supper. Our family stayed at Casa Anita over Thanksgiving 2014 and had a wonderful experience. 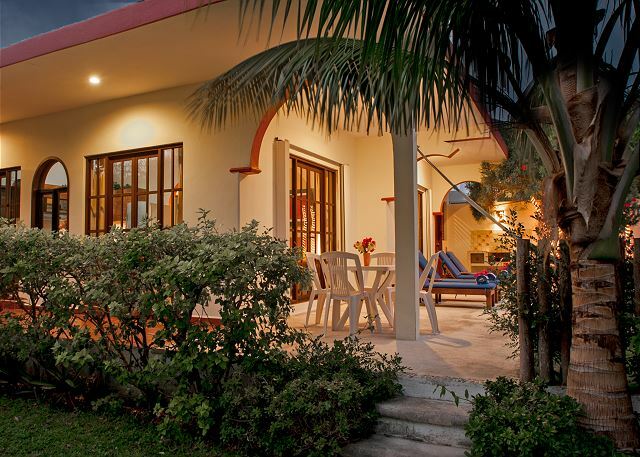 The casa has an old world charm with its wood windows and doors and mature landscaping. Plenty of room for a family of 4. The office staff are fantastic - can't say enough about them. The beach is a five minute walk and we strolled nightly into the town center. We recommend La Cantina Habanero for fish tacos but you will find many great places to eat in Puerto Morelos. Everyone is laid-back and very friendly. Casa Anita was all that we hoped for. We will definitely be back. Walker M from TULSA, Oklahoma does not recommend this vacation rental. A couple of good things. We loved the location and the staff was pleasant. I don't know if was just an off week for them but when we arrived there was a skillet on the stove with grease and pieces of bacon in it. Don't how long that has been sitting there. We turned on the air-condition in the master bedroom it didn't work moved to the second bedroom, they got it fixed but then water poured out covering the floor. Turned the light on in the kitchen it didn't work.I took a light out of lamp and put it in so we could have a light. Got a DVD from their office and found out the player wasn't hooked up to the television and when we got it working the DVD wouldn't play because it said, "not for this region." You only get five gallons of water for your stay after that you have to purchase it. I went in the morning and order another five gallon at 4:30 it hadn't come so I went back over and they had forgotten. We did get it and later that night someone came and apologize. I could tell you more but I think you get the picture. It is the little things that makes a property a good or great. Thank you for your honesty and we are sincerely sorry that Casa Anita, one of our most popular properties, was presented to you in this way. Clearly it was an "off week" for our staff and we are working with them to fix these oversights. As you can see from the many positive, previous reviews, normally our staff and properties are performing very well but there is no excuse for their poor performance in this case. We are glad you enjoyed the town and hope you can consider visiting again, if not with us then with one of the other properties in town. The outdoor space at Casa Anita was perfect and the location was great as well. The house could do with a few cosmetic touch-ups but was nice enough overall. Amenities were sparse but the staff were very helpful and quick to provide whatever we had run short of or was missing. Overall we were satisfied and would likely stay here again. Lovely house equipped with all you will need for a relaxing stay. Beach is a few steps away. Pictures don do it justice! Beautiful property and the staff at Abbey Del Sol could not have been more helpful and friendly! The best vacation ever! Everything was wonderful except for the ant issue in the kitchen area and the slow drain in the shower. Suggestions would be to purchase a beach umbrella and small cooler for the Villa. Also it would be nice to have had bikes that the seats could be adjusted. Otherwise everything was great. 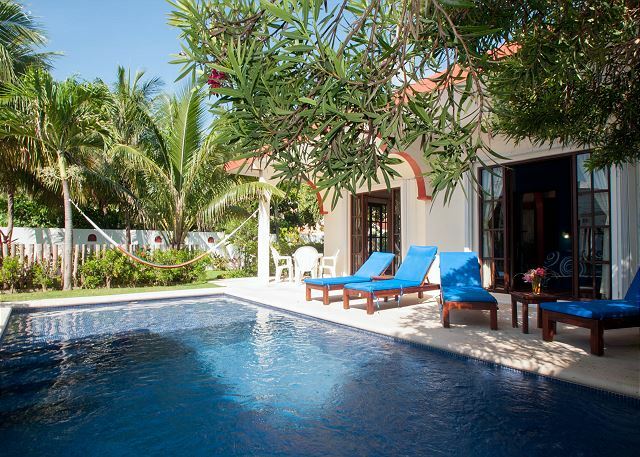 Nice escape in Puerto Morelos, with private pool! Very nice property with private pool only a block from the beach! Spacious with fans and A/C during those warm days! Great management staff there to help anything you need. Casa Anita con su jardín es un lugar muy agradable. La ceiba en el jardín llena mi corazón de alegría. La vista al mar también. This little property is lovely, we even had a resident cat during our stay. The property was spotless and the staff really helpful. My only reservation is about the noise around the property. There are several renovations going on nearby and there is some pretty heavy duty construction traffic using a turning circle in front of the pool. Constant drilling adds to that. The bedroom windows are traditional wooden slats rather than glazed so you awake with the birds and dogs in the morning. Despite those things though we had a lovely stay, and if the construction had finished, would definitely stay there again. Thank you to Nancy, Freddy, Jin, Cesar and the rest of the gang at Abbey del Sol! They were all so very friendly and helpful and made our first vacation with our 15 month old son one to remember. 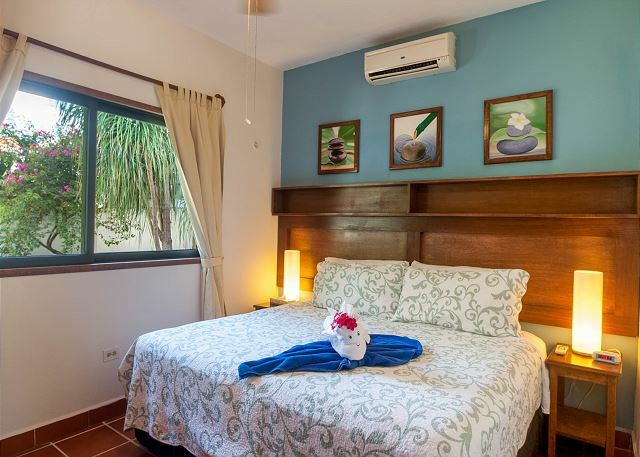 We were looking for a location that was comfortable, quiet, affordable, had it own pool, allow us to cook our own meals, had easy access to the beach and town without being in the middle of everything. Casa Anita fit all of these criteria and more! We found the property exactly as depicted on their website and very clean. It's the perfect property for a small family or two couples. The location feels very private because there are vacant lots on two sides. 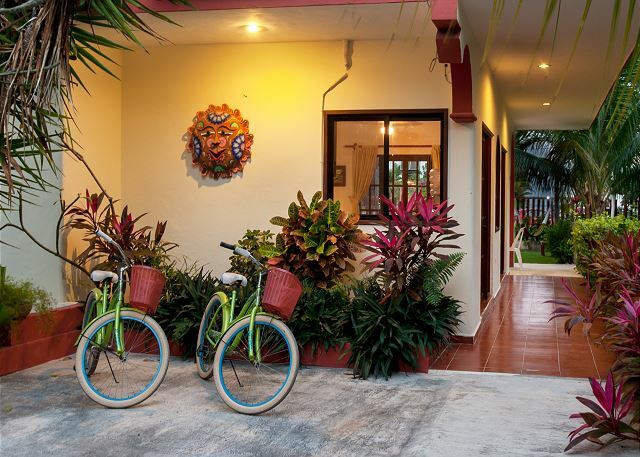 Also being close to the end of the north side of town is just the perfect distance to get away from the hustle and bustle of the town center while still being close enough for a nice walk or short rides on the Abbey del Sol provided bikes. Freddy was even nice enough to provide us with a bike equipped with a child's seat so our son could go on his very first bike rides which he loved! Access to the beach is an easy short two blocks out the back gate. The pool was wonderful and also perfect for our toddler son with its nice wading area. Again, Nancy and the rest of the staff are so friendly and helpful. Nearly anything we needed was easily obtained by either asking Nancy or could be bought at the store in town or in La Colonia. The kitchen was very well equipped and we were able to cook the majority of our meals at home. Overall, Puerto Morelos is a beautiful location, very safe, and everything from the beaches to the restaurants are amazingly child friendly. 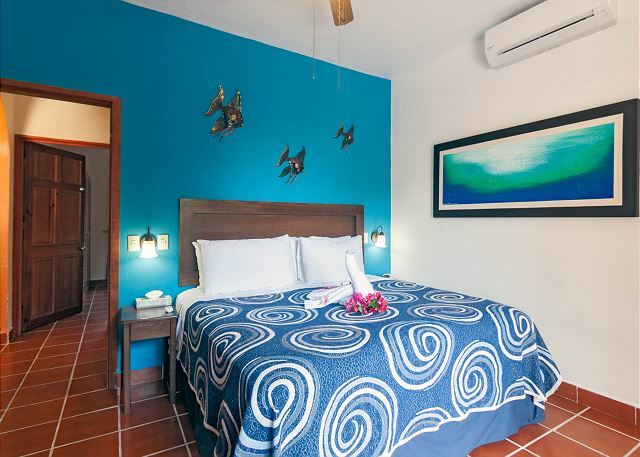 We will be highly recommending Abbey del Sol and Puerto Morelos to our friends and family. Muchas gracias for a wonderful experience! 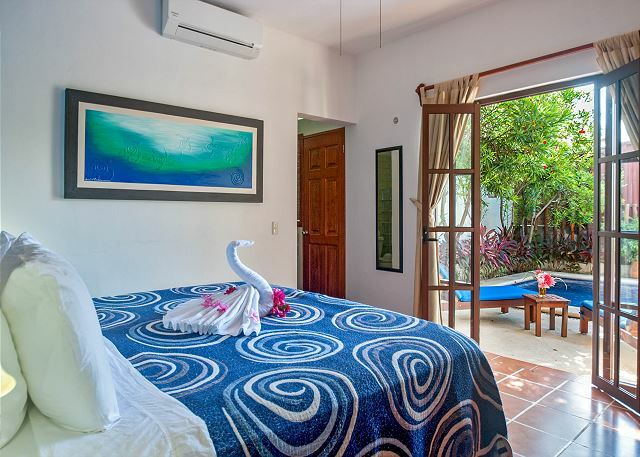 Casa Anita is a charming, secluded casita for the perfect vacation in Mexico. The house is well equipped, beautifully maintained and we loved the pool. The staff is there to serve your every need, and Abbey del Sol, as a property management company, is exceptional. 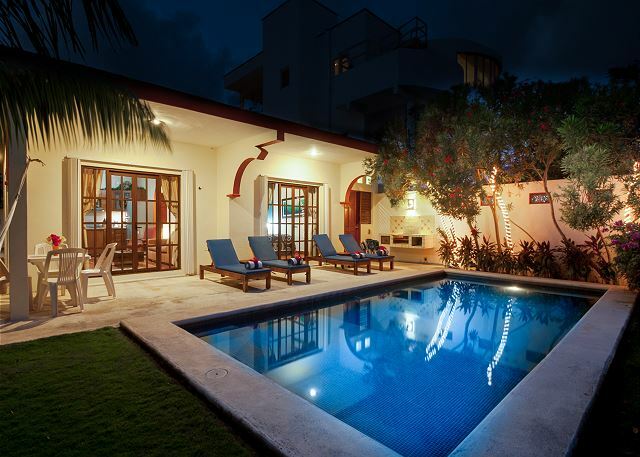 Casa Anita is the perfect property for a private retreat and comes with a great pool for cooling off morning, noon and night. A great plus is that we were only a short walk from the beach and a 15 minute walk to the town square. 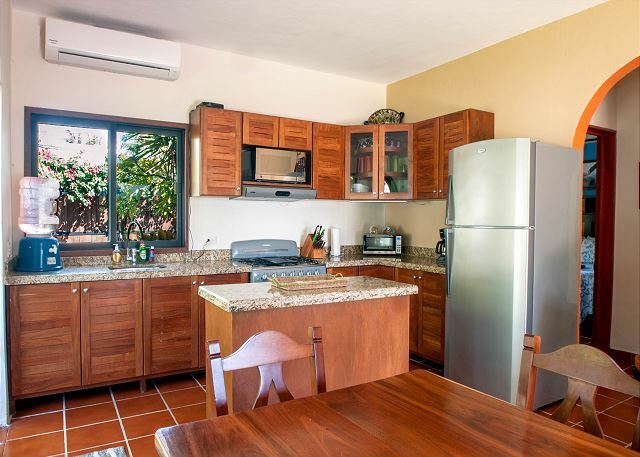 Meanwhile, the kitchen here has everything you need to create any meal you can think of and of course Puerto Morelos is filled with tasty, quaint restaurants. We used the free bikes to get around town every day. If you are looking for a quiet, private retreat, this is the place you have been looking for. we had a wonderful time at Casa Anita. The pool was perfect, especially for our son who spent most mornings and evenings in it. The beach was walking distance, less than 5 minutes. The house was clean and had everything we needed. We did grocery shopping and made breakfast at home and ordered dinner or went out most evenings using the guide that came with the house. The staff were very helpful. We even got a babysitter one night so that we could go out. We will return. My family and I had a wonderful time on our vacation this summer, and the main reason is because of where we stayed! Everthing was fantastic! We truly enjoyed the house, the location, the yard with the pool, and the proximity to the beach. We felt very safe and taken care off by your great staff and highly recommend renting from Abbey del Sol! My family & I enjoyed a wonderful week of relaxation at the beautiful Casa Anita, & some exciting adventures at nearby attractions. The house was everything we could want from a home away from home, the staff were welcoming, helpful & knowledgeable. I hope that we are able to return to this idyllic place in the very near future! the staff at Abbey del Sol was very helpful. the beds were comfortable. the house was private & secure. Casa Anita was just perfect for our vacation. The beds have new mattresses which were very comfortable. The private pool was a plus! and the yard has beautiful landscaping with palm trees and fresh flowers blooming daily! We enjoyed a massage under the palm trees during our stay. 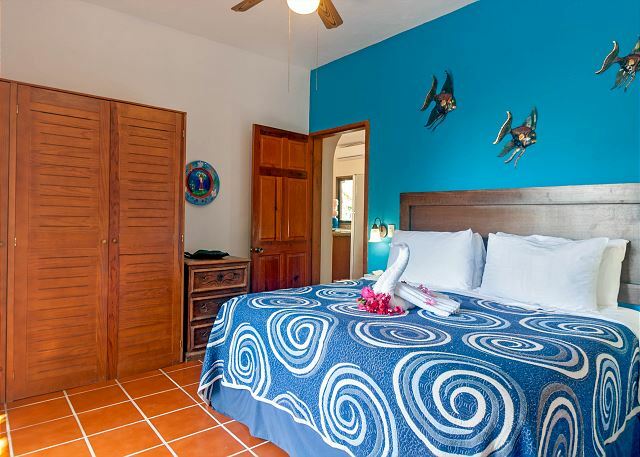 The staff was very helpful and friendly and we felt very safe at Casa Anita. Great Place to Stay! Our 10 days at Casa Anita werea all we expected and more. The house is lovely, with lots of light and space, feels a lot larger than it actually is. My wife was attending a workshop nearby, so we had friends for dinner several nigths at the terrace, the grill and kitchen equipment allows to entertain a group of at least 8 people. Don´t need to bring anythig but your clothes, shampoo and sunscreen, as the kitchen is fully equiped and the house has everyting you´ll need, from towels and beach towels to beach chairs, bicyces, etc. Already planing our next, hopefully longer visit! A most enjoyable stay. Would most definitely recommend the property. We enjoyed the "extras" such as loan of bicycles and the availability of cd's. Très éclairée, avec des boiseries, idéale pour un couple d'amoureux ou d'écrivains inspirés. 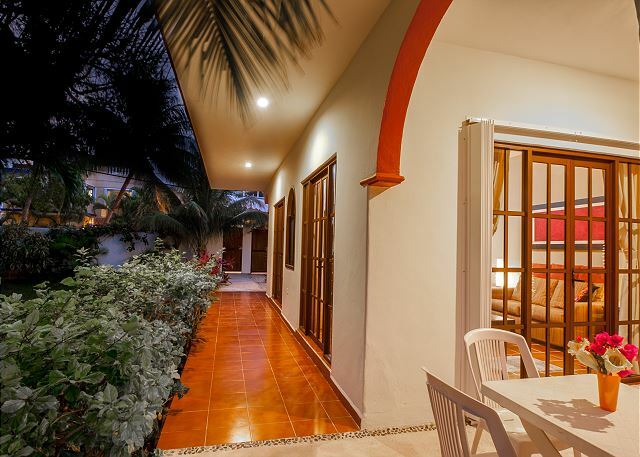 Casa Anita, our new oasis in Puerto Morelos. 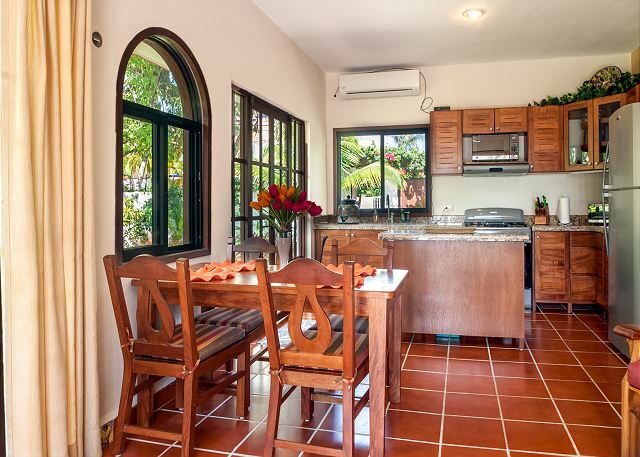 After searching the area for a rental to accommodate 3 people, we chose Casa Anita. The photos describing the property were very descriptive and met our needs. After arriving and settling in, we all agreed the photos did not do it justice. The casa was perfect!! Loved the openness of it, the wood windows and doors. There were 4 of them to get in and out of the casa. All with beautiful views of the property, side yard, and pool. We enjoy cooking while on vacation and found the kitchen to be well equiped. We also enjoyed BBQ'ing achiote chicken and arrachera out on the charcoal grill. The staff at Abbey del Sol just couldn't do enough for us, very professional. We will definitely be returning to Casa Anita. 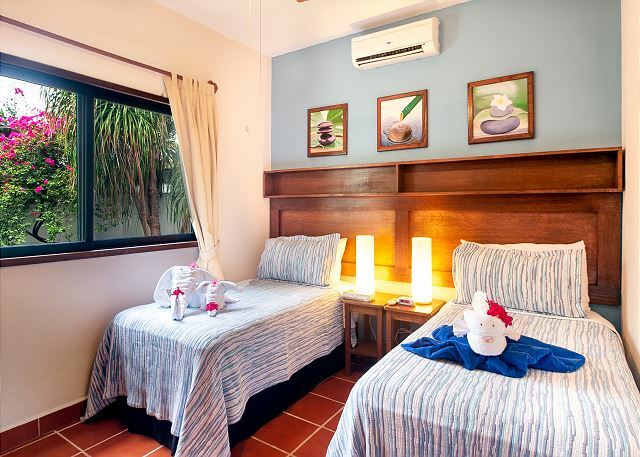 We had a delightful stay in Casa Anita, which had every facility that you might need on holiday and more.The spacious garden and well designed pool were perfect for our daughter and 2 year old grandson. Having the sea only two minutes walk away made life very easy. Support from the staff was first rate - advice, loans, DVDs etc. Thanks to everyone at Abbey Del Sol for being so generous and helpful. We were very pleased with the house and the staff at Abby Del Sol. Casa Anita was a home away from home. We highly recommend renting from Abbey and Tiff. Not only will you have a wonderful place to stay you will have a team of people dedicated to making your vacation special. Thanks Abbey, Tiff, Jin and Pilar! It felt like home and was great in every respect. Would have loved to have a small boom box / stereo though to connect my cell phone to rather than headphones. I was looking for some peace and quiet. A time for reflection, but also somewhere I felt safe being on my own. The house was wonderful, the staff was patient and helpful when I needed help getting oriented. I had been to Puerto Morels a couple of years ago, so I was somewhat familiar with the town. I like it cause it is quiet and every one is so friendly. So I could be alone, but if I wanted to go do something it was easy to find things and people were very friendly. I hope to come back with my family or some friends next time. Thanks so much for all your help! Everything we needed was there in the home. Partial beach vIew from the pool. Very nice side yard with iguninas to feed! We could even get fox network. Outdoor BBQ we used iif we weren't out at the wonderful resturants. P.S. Ladies don't bring to much stuff you won't need it!! We returned to Casa Mae in 2012, having stayed there in January 2010 as well. The new private pool is absolutely lovely. 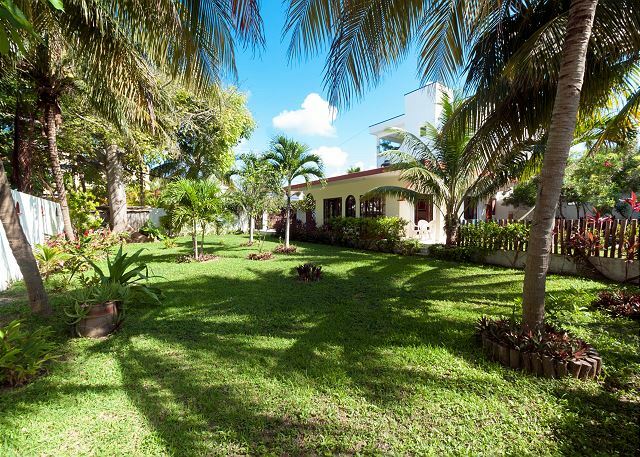 This bungalow has so many qualities - the large lawn area (where we watched two iguanas quietly grazing one afternoon), the mature trees, the accessible "sea"light that floods in from the direction of the beach. We like the simplicity of the house - it is calming. And we are so well looked after by Abby, Tiff and Jin and family - the vacation is like visiting a favorite relative who does everything in their power to make your stay enjoyable. Clarification - Marilyn and John's family stayed in both Casa Anita and Casa Mae. This review is actually about Casa Anita even though she wrote Mae. Casa Anita is a lovely Mexican casa. It was very clean and the perfect rental, for myself, husband and two children. The staff was extremely helpful and very nice. The location was great, so close to the Ocean. We really enjoyed the private swimming pool. I would highly recommend it to anyone wanting to stay in Puerto Morelos!! Very nice private place. Nice beach access for off the beach. Staff is incredible at taking care of guests even in a tropical storm. No need for rental car with the pickup/dropoff service at airport and taxis locally. Good restaurants, nice people,local artisians are are very talented. A great place to dream about in the cold days of winter! We came at the last minute....loved having such privacy! The pool is wonderful...surprise that we even had FOX on The TV...We wanted to escape five hot..too much tourist days at Playa Del Carmen..this worked for us. Freddie was super nice and was very professional.